Science (Practical) Note on Science Practical Notes, created by ClareArmstrong on 05/08/2013. DRAWING LINE GRAPHS Line graphs are the most common type of graph you draw in Science. They are used when presenting continuous data where two variables are used. An appropriate line graph should: · be drawn using a sharp pencil · have a clear and descriptive title · display the independent variable on the x-axis (the variable the experimenter purposely changes in an experiment) · display the dependent variable on the y-axis (the variable which changes in response to changes in the independent variable) · have axes with a clearly-marked, even scale that increases with even increments · always have the vertex representing (0,0) · have a scale which allows the range of data displayed to extend over more than half the grid in both directions (if the data is spread over a small range this can be done by starting at zero at the vertex, using a hash or a zig-zag, then starting with a value close to that of your smallest value) · have axes labelled with the appropriate quantity · have axes labelled with the appropriate units · have accurately plotted points drawn as neat, small crosses · a line or curve of best fit is required to represent a trend (unless told to not join the centre of each cross) · have a clear key if more than one line is shown on a graph using different lines (not points) for different data sets AN EXAMPLE OF A GRAPH NB. The points in the graph above should be drawn as crosses! Using the graph to predict results: 1. Interpolation eg. 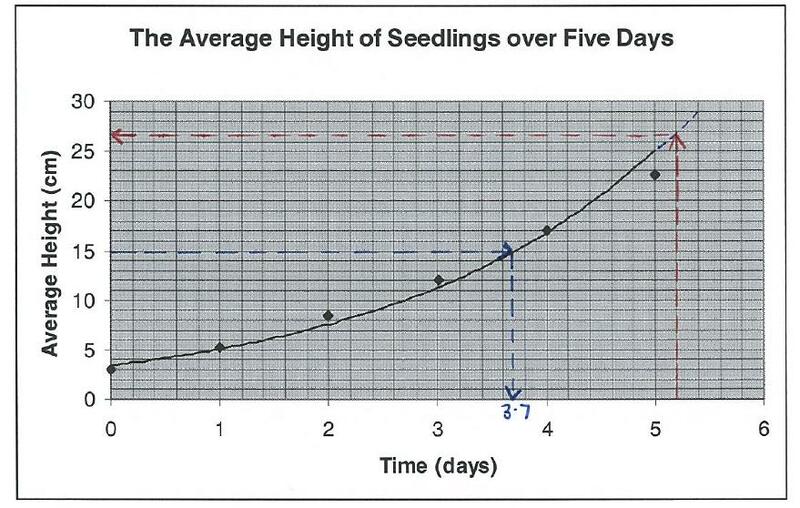 using the graph predict how many days it would take for the seedling to reach a height of 15 cm. Two lines must be drawn on the graph as shown below. ( a line from 15 cm on the y axis until it hits the graph and then a line down to the x axis which will give the expected number of days which is about 3.7 days). 2. Extrapolation eg. 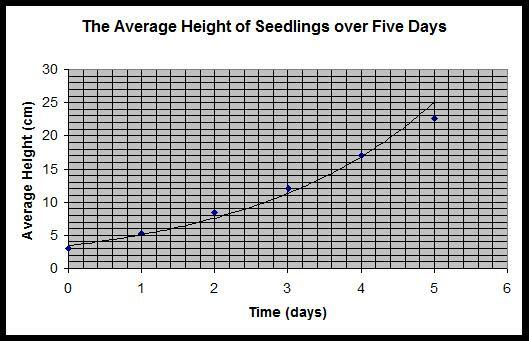 using the graph predict how high the seedling would be after 5.2 days. The line on the graph must be extended as shown and then two lines must be drawn on the graph as shown below (a line from 5.2 days on the x axis until it hits the graph and then a line across to the y axis which will give the expected height which is about 27 cm). ACCURACY Accuracy for 1st hand investigations depends on the design of the experiment (i.e. the validity of the method) and the sensitivity of the instruments used.Accuracy for 2nd hand investigations depends on whether the same/similar info can be found in other VALID sources. If you are asked to evaluate the validity of either a first hand or second hand investigation, you are expected to look at individual criteria and give an overall assessment. Please do NOT confuse reliability with validity but DO recognise that both reliability and validity increase the ACCURACY of the investigation. EXAMPLE: “An electronic balance was used to record the mass of one teaspoon of sodium chloride, in grams, correct to two decimal places” OR “The mass of one teaspoon of sodium chloride was recorded, using an electronic balance, in grams, correct to two decimal places” A procedural recount should be written impersonally. You should not use terms such as I and we. EXAMPLE: “Water was poured to the beaker” NOT “I poured water into the beaker” or “Poured water into the beaker” E. Drawing a scientific diagram. To draw an appropriate scientific diagram you should: Ø use a sharp pencil Ø use a ruler Ø draw using unbroken lines Ø draw it in 2D Ø make sure the diagram is an appropriate size (approximately 1/3 of a page) Ø label each piece of equipment Ø draw each piece of equipment in proportion Ø draw the equipment as it is set up, not separately Ø not include equipment such as electronic balances F. Presenting your results. The results you record should be observations only. No inferences should be made. Ø If you are collecting numerical data, use a table to present your results (following the SCEGGS guidelines). Ø If your collected data allows it, a graph should be plotted (following the SCEGGS guidelines). Ø If no numerical data was collected, then write out your observations as clearly as possible (a table might still be appropriate here). G. Include a discussion. A discussion explains your experiment to another person. It should include: Ø an explanation of your results. Ø the identification of errors in your experiment. Ø an assessment of the reliability of the experiment (repeat and average). Ø an assessment of the validity of the experiment (comment on; how well the variables are controlled, if the most appropriate equipment was used, if there was a suitable range of measurements). Ø any suggestions of improvements that could be made to increase the accuracy of the experiment. H. Writing a conclusion. The conclusion should be one sentence that answers the aim specifically. It should be a general statement that does not include any results or personal pronouns. EXAMPLE: As the temperature of the water increased, the time taken for the sugar to dissolve decreased. A. Give your report a descriptive title. B. Include an aim. Ø Start your aim with the words To investigate, To determine or To observe. Ø The aim should include both variables that you are investigating. Ø Your dependant variable is usually written first, the independent variable written second. EXAMPLE: To investigate the relationship between plant height and the mass of fertiliser added to the soil. dependent variable independent vaiable C. Include an equipment list. D. Writing a detailed and concise method. A method should be written such that anyone who reads it could carry out the experiment without difficulty. A method should also mention how each aspect of the experiment is controlled. 1. Use numbered steps (to be clear, use one numbered step for each action carried out) 2. Do not omit any steps carried out in your method or write them out of order, but keep each step brief and to the point. 3. Name all equipment used in each step. 4. Mention exact quantities of measurements taken and the units used. 5. If possible, record how accurately you took your measurements (ie “…to two decimal places”, or “…to the nearest mm”). 6. For reliability, each set of results should be repeated at least 3 times and then averaged, to reduce inconsistent readings. EXAMPLE: Using an electronic balance, record the mass of one teaspoon of sodium chloride, in grams, equitmant used exact quantity used units used correct to two decimal places. accuracy of equipmentA method can be written in two ways, depending on when you conduct the experiment. If you are simply planning a method (or writing it before you carry it out) then it can be written as a series of steps in the present tense such as: EXAMPLE: “Using an electronic balance, record the mass of one teaspoon of sodium chloride, in grams, correct to two decimal places”. However, if you are writing a scientific report AFTER you have carried out an experiment, then it is known as a procedural recount. A procedural recount should be written in past tense. CONSTRUCTING TABLES 1. All tables should have a title (heading) that tells the person analysing the table what information is contained in the table. 2. A border surrounds the entire table. All lines in the table must be ruled with a ruler. 3. The table should be written in pencil, so that changes can be erased. Planning the format of the table may assist is reducing mistakes. 4. Each column must have a heading. This will be the top cell in each column. 5. If a column contains measurements, the units of the measurement should be placed in the column heading (within brackets). The unit should NOT be repeated in each cell underneath the heading. For example: If the temperature of water was measured each minute, the column heading would be: “Temperature (0C)”.